ANNOUNCEMENT: PLEASE LIKE NYCRD ON FACEBOOK FOR SPECIAL FACEBOOK ONLY OFFERS! Lots of museums have free days, as Newyorkology reports. However, Smithsonian Magazine is mixing it up by naming September 25 FREE MUSEUM DAY. 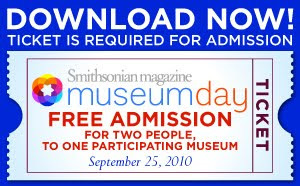 Everyone can register for a FREE ticket to a museum on September 25 thanks to Smithsonian Magazine. Tell a friend and you both can register for the same place and make it a special day out! For your Free Museum Day ticket, fill out this online form. Your ticket will be emailed to you and you must print it to redeem. Close to 80 New York museums are participating. Click here to sign up to receive NYC Recession Diary Emails!